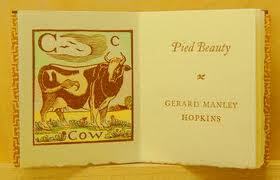 Pied Beauty Research Papers explore a poem by Gerard Manley Hopkins about the glories of God's creations. It is only then that the reader realizes that this is not a simplistic poem. Hopkins is not simply saying “Thank God for the cows and fish.” He is, rather, thanking God for the exquisite details and intricacies that most people neglect to notice. This is a poem of extreme gratitude and wonder. Hopkins is thanking God for the quality of life and for his ability to appreciate it. Since the poem opens with the words “Glory be to God” and closes with the words “Praise him,” it can perhaps be thought of as a sort of prayer--which was a brazen, sacrilegious tactic to use during Hopkins’ time. But as an artist, he was attempting to expand his peers’ horizons, and to show that, owing to the magnitude and complexities of God’s creations, that there will always be another incredible detail to notice. Hopkins seemed to be challenging the readers to look further, and for his peers to examine their religious lives more deeply. And these animals, plants and tools, and, as he put it, “Whatever is fickle, frecklèd (who knows how? )/With swíft, slów; sweet, sóur; adázzle, dím;” can also symbolize man’s self. A man can look deep within himself, for example, and can discover wonders of compassion and goodness. He may even discover that he has a “dappled” soul or a heart “freckled” with kindness. What is Beauty research papers examine the definition of beauty and the philosophic topic of beauty. William Wordsworth - To this end, this investigation considers the override theme of nature in Wordsworth's poetry. Blessing the Boats research papers analyze Lucille Clifton's poetry on religion and minority woman. Gilgamesh and Religion - Epic poems that are sufficiently ancient to be called mythological contain a great deal of religious content. Augustan Poetry - The world, in Augustan Poetry, could be viewed as subject to the logical order, in a clear power structure that was under the direction of God. From Pent-Up Aching Rivers - From Pent-Up Aching Rivers by Walt Whitman, speaks of a different kind of “river” – that of a person’s human desires, which ebb and flow like a tidal river. Crossing the Bar by Alfred Lord Tennyson - Crossing the Bar by Alfred Lord Tennyson essay discuss Tennyson's last poem that reflects upon the aspect of death. Analysis Reference to Her Children - Analysis of " In Reference to Her Children" essays look at Anne Bradstreets poem about her children, and the symbolism it portrays. Desire Faerie Queene - Desire in the Faerie Queene research papers overview the poem by Edmond Spenser and his use of desire. Once by the Pacific Research Papers explore this poem as a metaphor for life. Paper Masters writes custom research papers on Pied Beauty and explore a poem by Gerard Manley Hopkins about the glories of God's creations.